WEST FARGO, N.D. - Three new plate compactor models expand Doosan excavator versatility and make quick work of restoring trenches. Featuring a flat top mount design, the Doosan plate compactors can easily be mounted to different carriers. The flat-top design allows a "cap" to be added to the attachment based on the specific machine being used. Four outboard shock mounts distribute vibrations evenly while keeping the attachment level, improving compaction efficiency and extending component life. Standard flow controls prevent over-speeding, which can lead to poor compaction and reduce bearing life. Applications for the plate compactor attachments include compacting trenches, footings and slab areas. An excavator-mounted plate compactor attachment provides more powerful compaction force than hand-operated compactors and reduces the need for workers in the trench. The PCX64 is approved for the Doosan DX140LC excavator, with a baseplate width of 23 inches. The attachment's dynamic force is 6,400 pounds and the compaction frequency is 2,000 vibrations per minute (vpm). The PCX114 is approved for the Doosan DX140LC, DX180LC, DX190W, DX210W, DX225LC and DX255LC excavators. It features a baseplate width of 27 inches, 2,000 vpm frequency and 11,350 pounds of dynamic force. The PCX220 is approved for the Doosan DX255, DX300, DX350, DX420, DX480 and DX520 excavators. It features a baseplate width of 32 inches, 2,100 vpm frequency and 22,000 pounds of dynamic force. Doosan Infracore Construction Equipment America, headquartered in West Fargo, N.D., markets the Doosan brand of products which includes large excavators, wheel loaders and articulated dump trucks. With more than 100 heavy equipment dealer locations in North America, Doosan is known for an unmatched dedication to service and customer uptime, and durable, reliable products. Doosan is fast becoming a global force in heavy construction equipment. 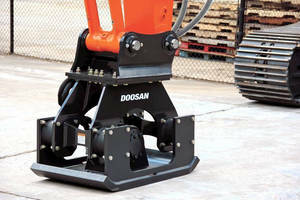 For more information on Doosan products, visit www.doosanequipment.com.